This Norman Rockwell Santa Claus painting was the 212th published Norman Rockwell Saturday Evening Post cover. Rockwell's career with the Post spanned 47 years, from his first cover illustration, Boy With Baby Carriage in 1916 to his last, Portrait of John F. Kennedy, in 1963. 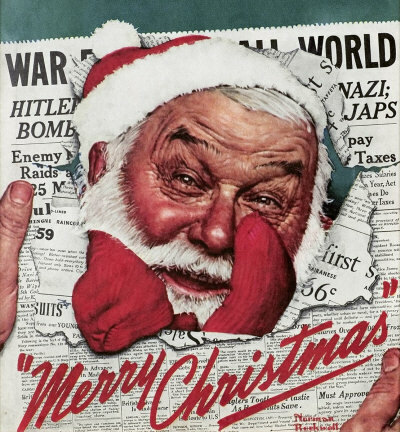 This was also the eighth Rockwell Post cover of 1942. And to think it only cost ten cents when it was mint condition! The bad news is all over the newspaper, no matter what year we are talking about. In 2010, the news is all about how bad the economy is, how crooked the politicians are and how high the cost of living, especially health care, is. The climate is changing (as it always has, by the way: don't be afraid) and the world is going to the devil in a handbasket. Hate is rampant, etc, etc, etc. In 1942, things were the same, only worse. There was a world war going on. No doubt, it was orchestrated in the same way every war before and since has been, but war is war. War is dangerous to the whole world. The newspaper is full of negative words, especially on the front page. Then Santa and Merry Christmas break through the madness of the world. Just when it all looked bleak, Santa puts our worries and fears to rest. Christmas and holiday joy will come after all, no matter how sorry the world looks. That is the news we all needed to hear. Do You Have A Great Story, Opinion Or Contribution About Santa Face in Newspaper?